Also called the statement of financial condition, it is a summary of a company's assets, liabilities, and owners' equity. A statement of a company's assets, liabilities, and stockholder equity at a given period of time, such as the end of a quarter or year. A balance sheet is a record of what a company has and how it has come to have it. A balance sheet is divided into two main sections, one that records assets and one that records liabilities and stockholder equity. The assets should generally equal the liabilities and stockholder equity because the latter two are how the company paid for its assets. 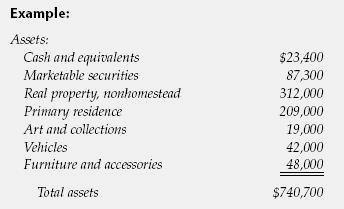 Examples of items recorded as assets include accounts receivable and property, plants, and equipment. Examples of liabilities include accounts payable and long-term bonds. The financial statement of a business or institution that lists the assets, debts, and owners' investment as of a specific date. Assets are ordered according to how soon they will be converted into cash, and debts according to how soon they must be paid. Because balance sheets do not list items at their current monetary value, they may greatly overstate or understate the real value of certain corporate assets and liabilities. Also called statement of financial condition, statement of financial position. See also consolidated balance sheet. A balance sheet is a statement of a company's financial position at a particular moment in time. This financial report shows the two sides of a company's financial situation -- what it owns and what it owes. What the company owns, called its assets, is always equal to the combined value of what the company owes, called its liabilities, and the value of its shareholders' equity. Expressed as an equation, a company's balance sheets shows assets = liabilities + shareholder value. If the company were to dissolve, then its debts would be paid, and any assets that remained would be distributed to the shareholders as their equity. Bankruptcy occurs in situations where there is nothing left to distribute to the shareholders, and the company balance sheet is in fact unbalanced because the company owes more than it owns. Fig. 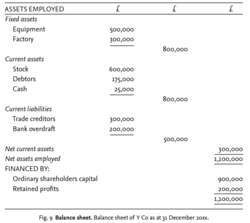 9 Balance sheet. Balance sheet of Y Co as at 31 December 20xx. An accounting statement of a firm's ASSETS and LIABILITIES on the last day of a trading period. The balance sheet lists the assets which the firm owns and sets against these the balancing obligations or claims of those groups of people who provided the funds to acquire the assets. Assets take the form of FIXED ASSETS and CURRENT ASSETS, while obligations take the form of SHAREHOLDERS' CAPITAL EMPLOYED, long-term loans and CURRENT LIABILITIES. The balance sheet is compiled by summarizing information derived from the LEDGER accounts and provides a condensed financial snapshot of a company's state of affairs. 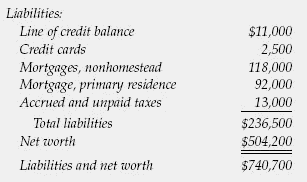 A simple balance sheet is illustrated in Fig. 9 overleaf. Assets include fixed assets (such as equipment and buildings) and current assets (stocks, debtors and cash); liabilities include money owed to the bank and suppliers of raw materials and components. The difference between current assets and current liabilities is referred to as the net current assets or WORKING CAPITAL. Working capital plus fixed assets equals NET ASSETS employed or NET WORTH. This is equal to LONG-TERM CAPITAL of the company and represents monies subscribed by SHARE HOLDERS (the owners of the company), together with any profits retained in the business. Thus, fixed assets + (current assets – current liabilities) = long-term capital (‘net worth’). an accounting statement of a firm's ASSETS and LIABILITIES on the last day of a trading period. The balance sheet lists the assets that the firm owns and sets against these the balancing obligations or claims of those groups of people who provided the funds to acquire the assets. Assets take the form of FIXED ASSETS and CURRENT ASSETS, while obligations take the form of SHAREHOLDERS’ CAPITAL EMPLOYED, long-term loans and CURRENT LIABILITIES. A semi-itemized listing of all assets and liabilities of a person or a company in order to arrive at a net worth, which is the difference between the assets and the liabilities. Most lenders require a balance sheet as part of the loan application process.Short-term debt,which will be paid off in one year or less,is treated by lenders in a different manner than long-term debt when calculating their various ratios to determine loan eligibility. As a result, consumers would be well advised to separate the two types of debt when completing a balance sheet form provided by the lender. One of the primary weaknesses of a standard balance sheet is that it does not reflect any contingent liabilities—matters which may become liabilities in the future,but then again,may simply disappear. These are things like loans guaranteed for children, the results of pending litigation, and penalties and interest that may be imposed at the end of a current tax audit.In accounting,such matters are noted in footnotes. Some mortgage application forms specifically ask about contingent liabilities, and others do not. Obviously, the rosy picture presented in the preceding example balance sheet would change markedly if the owner disclosed involvement in a multimillion dollar lawsuit for which there was no insurance coverage,and which might result in a judgment in the future. Balance sheet analysis of Enshi Yilida Investment Co.
Balance sheet analysis of Luzhou Wanli Compressed Natural Gas Co.
Balance sheet analysis of Puyang Refractories Group Co.
Balance sheet analysis of Zhengzhou Oriental Enterprise Group Inc.
Balance sheet analysis of Vesuvius Advanced Ceramics (Suzhou) Co.
Balance sheet analysis of Liaoning Haicheng Zhongxing Mining Group Co.